This Tutorial is intended for a Workgroup and not for a Domain type of network. Also, if you have both wired and wireless devices that need to communicate in one internal network you may use this tutorial to share network resources such as integrated and external drives, folders, files and wired/wireless printers. In this guide, we will be utilizing the Business and not Home Versions of Windows Operating Systems. If you have a combination of Home and Business versions of Windows Operating Systems, this guide will also work but with slight discrepancies on some configurations. You must have Administrative privileges to complete this process. A Server won’t be necessary in this Tutorial. For a better network performance and to avoid network bottlenecks, using advanced technology would help. 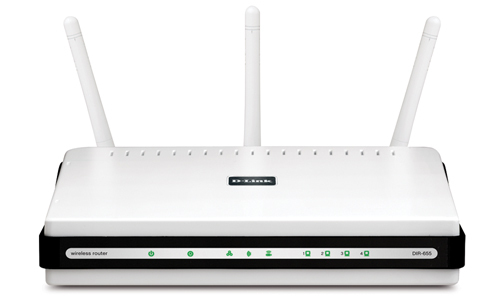 For example, instead of using a B/G router, an N Router will perform better. A router with 1000Mbps or Gigabit ports and Network Adapters that supports 100/1000Mbps is also doable for faster network transfer rates. Gigabit Network Switches would be beneficial. Pre-requisites: Computers with Network Adapters for LAN and WLAN, Network Switch (for additional wired devices), Wireless Router (verify that DHCP is enabled), a working Broadband connection, a couple of straight network cables (Cat5e or higher) other wired and wireless devices such as Printer, NAS etc. Connect all the computers and wired devices to the Router’s LAN or Ethernet Ports (usually 4), you may add a Network Switch (to be plugged into the LAN or Ethernet Port of the router) if you will be connecting more wired devices such as Printer and NAS. The wireless computers and devices will need wireless network adapters also known as Wi-Fi adapters. Make sure that the wired and wireless devices are able to communicate to the router and access the internet. 1. 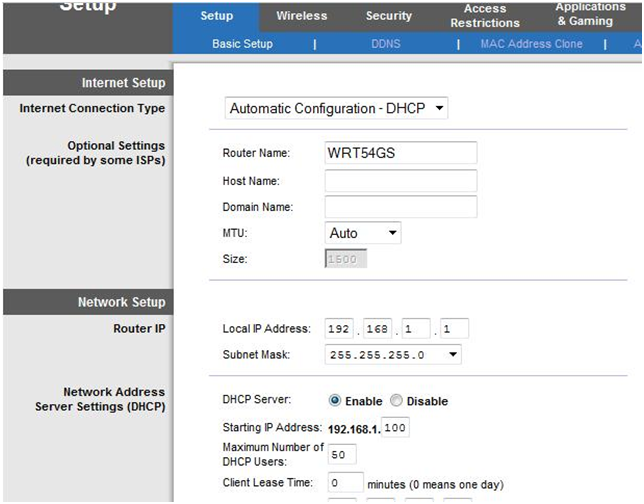 Enable DHCP in the LAN (Local Area Network) or WLAN (Wireless Local Area Network) settings on all the computers in your network. In Windows 7 and Vista – Click on the Start button, type ncpa.cpl then press enter to open up the Local Area or Wireless Connection Status screen. Double click on Local Area or Wireless Connection, then click on Properties, double click Internet Protocol Version 4 (TCP/IP v4), make sure that Obtain an IP address automatically and Obtain DNS server automatically are both enabled. 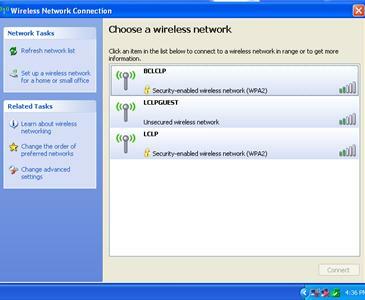 In Windows XP – Click on Start, type ncpa.cpl to open up the Local Area or Wireless Connection screen. Double click on Local Area or Wireless Connection, then click on Properties, double click on Internet Protocol Version 4 (TCP/IP v4), make sure that Obtain an IP address automatically and Obtain DNS server automatically are both enabled. 2. 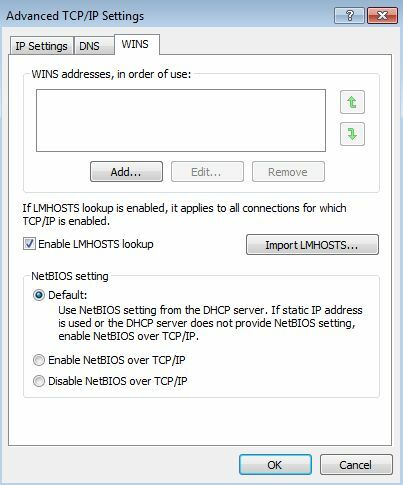 Enable Netbios or verify that Netbios is enabled.While you’re in the LAN or WLAN settings, to check if Netbios is enabled…. In the General Tab, click on the Advanced button. In the Netbios setting, make sure that the radio button is On under the Default. 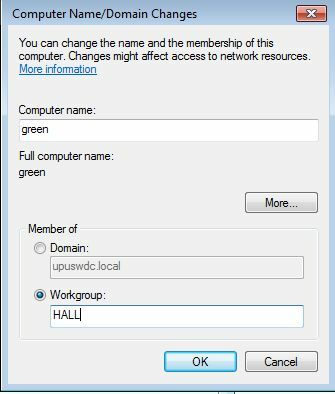 In Windows Vista and 7 – Click on the Start button then go to Control Panel, click on System and Security, click on System then click on Change Settings then type the Computer Name (must be unique) and your Workgroup (must be identical on all computers). In Windows XP – Click on Start, right click on My Computer, then Properties, in the Computer Name Tab then type the Computer Name (must be unique) and your Workgroup (must be the identical on all the computers). In Windows 7 and Vista – Click on the Start button, then go to Control Panel, click on User Accounts and Family Safety, click on User Accounts, click on Manage User Accounts. 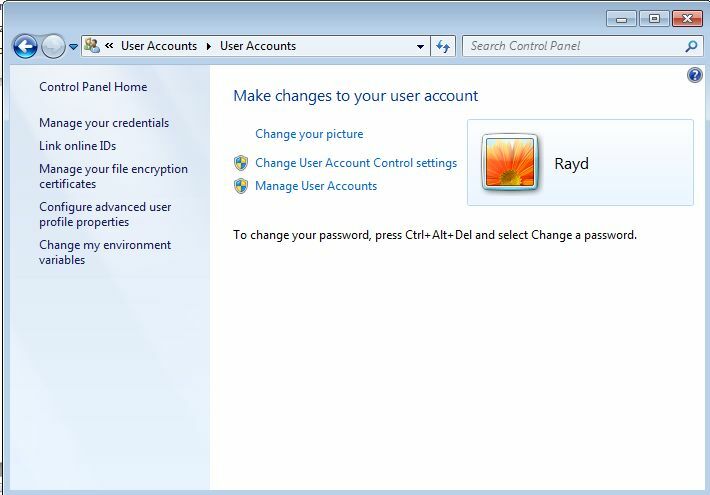 In Windows XP – Click on Start, then go to Control Panel, go to User Accounts, and click on Create a New Account. In Windows 7 and Vista – Click on the Start button, then go to Control Panel, click on System and Security, click on Windows Firewall, in Allowed Programs make sure that File and Printer sharing box is checked. In Windows XP – Click on the Start, go to Control Panel (Category View), go to Security Center, find Windows Firewall, then in Exceptions Tab, make sure that File and Printer sharing box is checked. In the next guide we will share a Folder or a Drive (C, D). 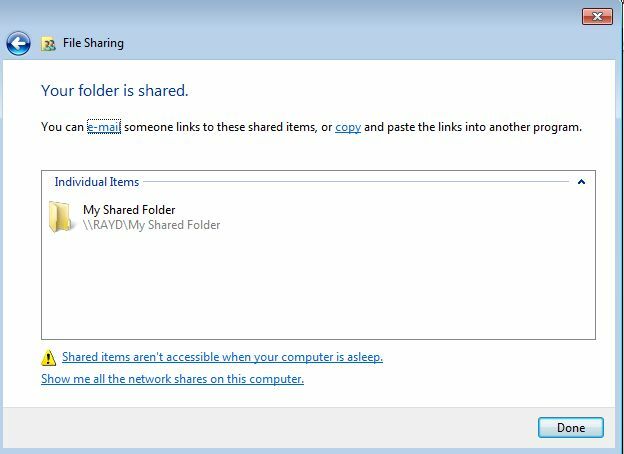 I have created a Folder called ‘My shared folder’. Right click on it, choose Properties, in the Sharing Tab click on Share. 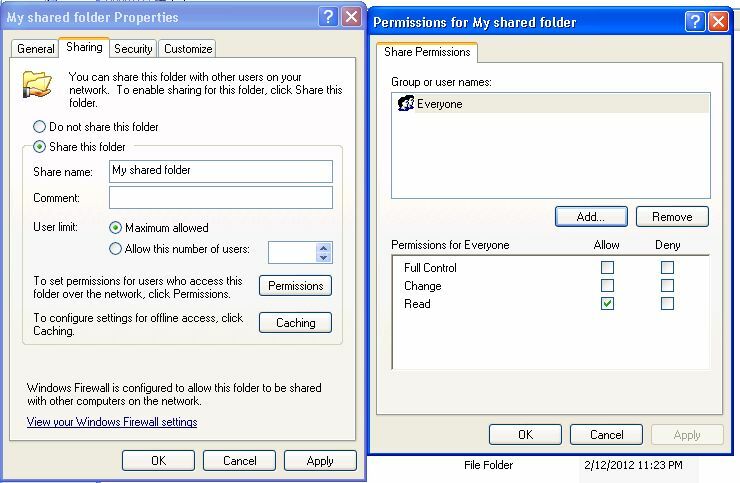 Add the User(s) that need to access the shared Folder and assign User permission in the Sharing Tab. In the Security Tab, verify that the same User has been automatically added. In Windows XP Professional, it is a slightly different process. Right click on the Shared folder. Go to Properties, on the Sharing Tab, click on Permissions button, verify that Everyone is there, if not manually add Everyone and leave the default to ‘Read’ permission for now. 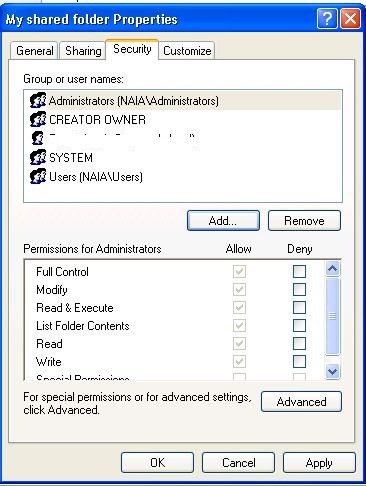 Add the Users and assign them Read or Read/Write permissions if applicable. Click Ok to save the setting. 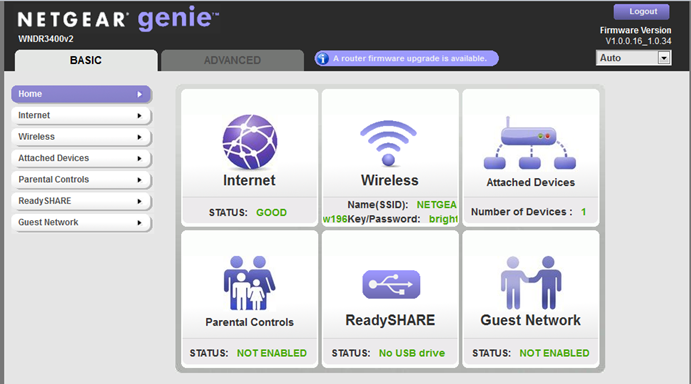 In the Security Tab, click on the Add button and add the Users, then assign them permission as well. From the computer that you would like to access the shared folder thru its IP Address or Computer Name…..
or….Click on the Start Orb and type \\Computername\SharedFolder or Shared Drive then press enter. In Windows 7 and Vista – Click on Start, go to Control Panel, go to Hardware and Sound, go to Devices and Printers. 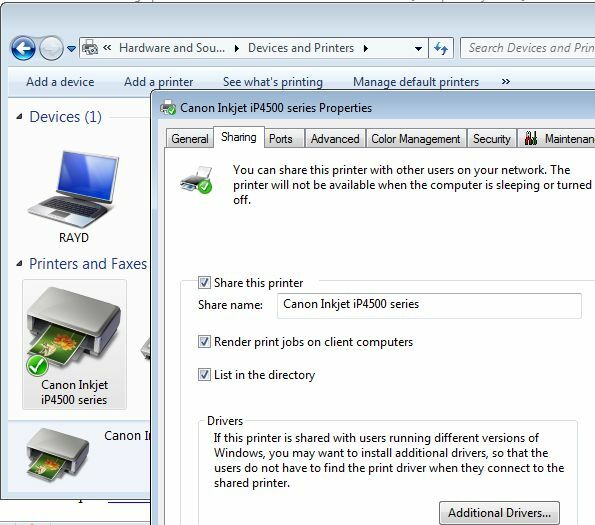 Right click on the printer that you need to share, choose Printer Properties, in Sharing Tab make sure that ‘Share this Printer’ and ‘List in the Directory’ boxes are checked. In Windows XP – Click on Start, go to Control Panel (Category View), go to Printers and Other Hardware, Pick a Task, choose ‘View Installed Printers and Faxes’, then right click on the Printer that you wish to Share then choose Sharing. In the Sharing Tab choose Share this printer, make sure that ‘List in the directory’ is selected and then click Ok. In Windows 7 and Vista – Go to Control Panel, go to Devices and Printers, go to Add a Printer, click on Add a Network, click on Add a Network, Wireless or Bluetooth Printer. My preferred method….Click on the Start button and type \\IPAddress (Computer’s IP Address you are trying to connect to) press enter or type the \\ComputerName then press enter. You will now see the name of the printer shared from the network, double click on it to install to your computer. In Windows XP – Go to Control Panel (Category View), Printers and Other Hardware, Add a Printer, Welcome to the Add Printer Wizard, click next, click on A Network Printer, or a printer attached to another computer. My preferred method….Click on Start, in the Run box type \\IPAddress (Computer’s IP Address you are trying to connect to) press enter or type the \\ComputerName then press enter. Note: See this ipconfig /all Tutorial on how to find out the IP Address of a computer. You may also use Advanced IPScanner to find all IP Addresses, Mac and Host Name in your network. If you have a network printer that can be wired to the router thru a patch network cable (Cat5e or higher) plug it in to the router’s LAN or Ethernet port. If you want to connect a Wireless printer to your wireless network, make sure to have the SSID and passphrase ready. In order to setup a wired (thru a USB or Ethernet cable) or wireless network printer, you will need the installation CD that came with your printer, then install it on all of your computers and follow the Setup Wizard. If you have a NAS, unpack your NAS device from its package; it should come with a patch network cable and an installation CD. Plug the power cable to the NAS, connect the network cable from the NAS to the router’s LAN port or to a network Switch, turn on the NAS, and wait for the light to stabilize. Insert the CD to any computers in your network then follow the straight forward installation. Make a note of the IP Address that will be assigned to your NAS, you will need this later on to access the NAS’s configuration. 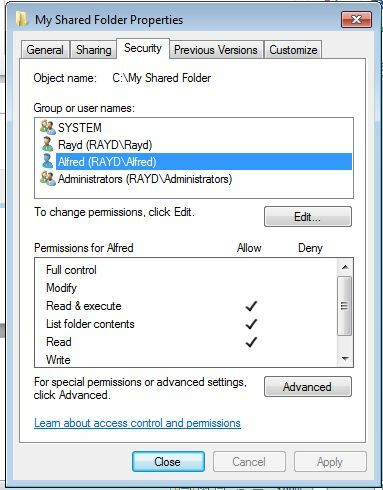 Create file folder(s), assign Users with permission as needed and you will be all set. If your router has a USB Port, you may utilize it and share a USB external hard drive for backup purpose and printer in your network. 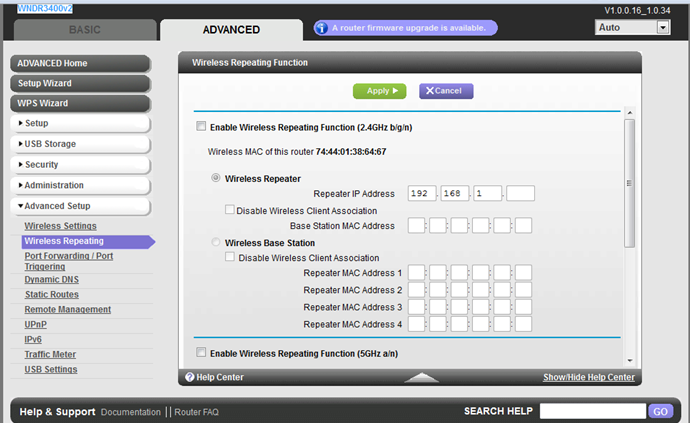 You will access them thru the Router’s IP Address and the network resource name. You may also share the Media by using your Smart Phones such as IPhone and Android. All you need is to download the Apps for Media Sharing. Android phones by default comes with a ‘Media Share’ App. Just in case that you can’t access the shared driver or folder – check your Firewall or Security Software and make sure that File and Printer Sharing is set to Allowed. 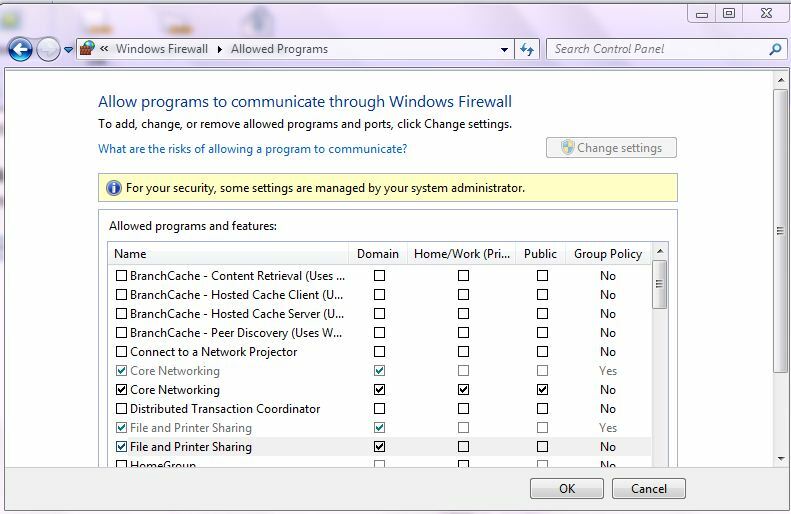 If you can’t access any network resources, you may temporarily disable your Security or Firewall Software. To do this, click on the Start Orb and type services.msc press enter, locate your Security or Firewall Software and choose Disable or Stop for now until you’re able to access the network files/printer. To find out if the computers are communicating to each other try pinging the IP Address of the computer that you wish to gain access to its network resources. To do this, click on the Start Orb and type cmd press enter. From the command prompt type the IP Address of the computer that you need to access or connect to, for example type ping 192.168.0.3 press enter. If you get a ‘Request timed out’ then your computer is unable to communicate to the other computer in your network. Sometimes, a comprehensive network troubleshooting might be needed if it gets a little complicated to resolve any network issues. In this Tutorial we will be using a D-Link DIR 655 wireless router connected to a Charter Communications Cable Modem. 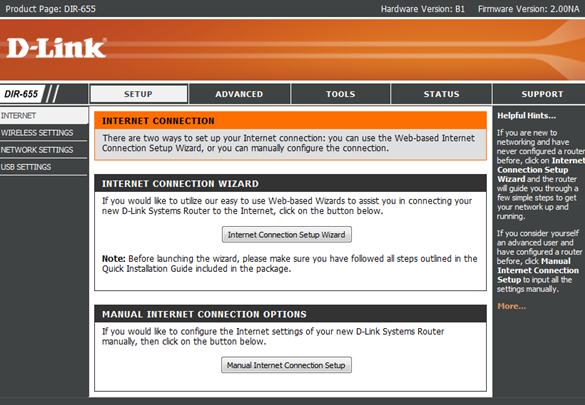 We will not be using the D-Link installation CD but will manually configure your router. To begin, connect a patch network cable between the Modem’s port and the Router’s WAN or Internet Port. Connect a patch network cable from one of the router’s LAN or Ethernet Ports to each device that will use a wired connection. Keep an eye on the Modem and Router’s lights until they are stabilized. From a computer wired directly to the router, open up your favorite browser and type in http://192.168.0.1. 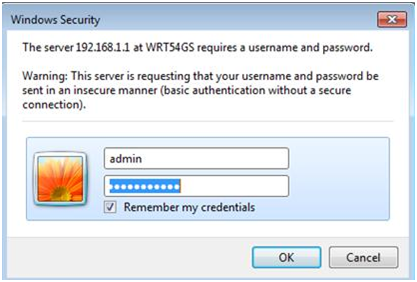 Type the Default User Name of admin and the Password is blank. Note: You may have to do a Power Cycle in case that you can’t access the router’s configuration page. 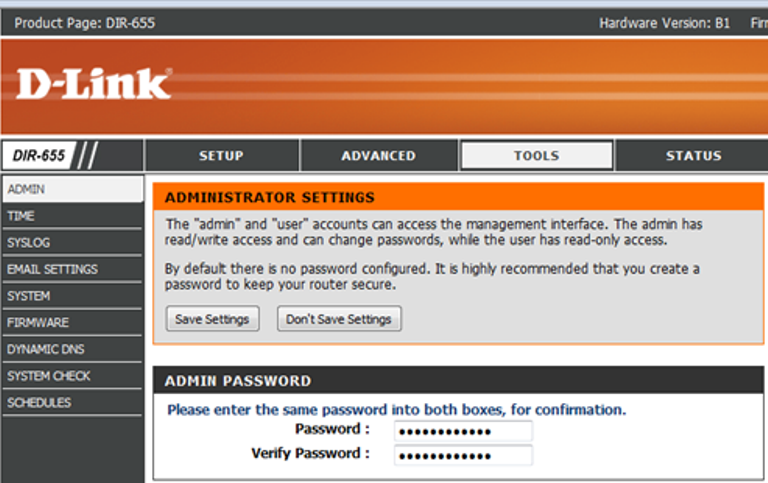 In the Tools Tab, change the Admin Password right away for security reason, do not use the default D-Link Admin Password. 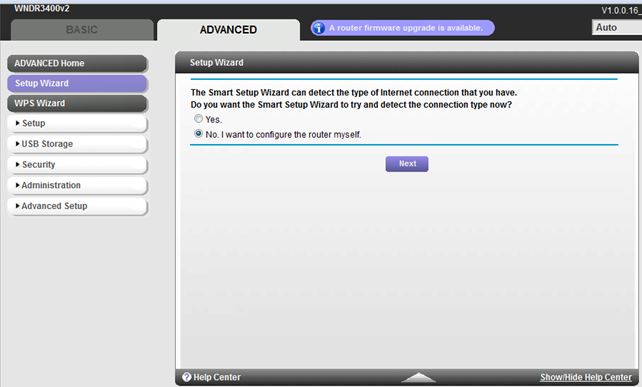 In the Setup Tab you may either select the Internet Connection Setup Wizard or Manual Internet Connection. 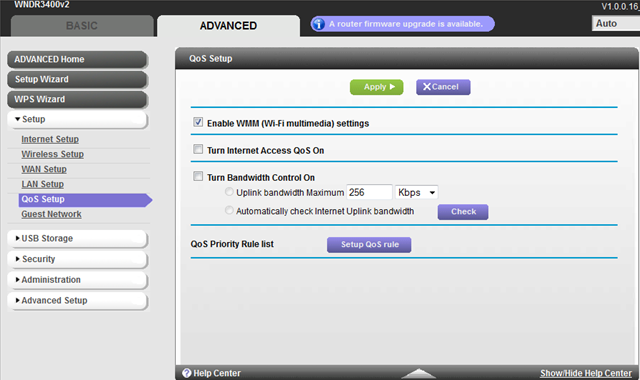 In this Tutorial we will select the Manual Internet Connection option. In the Internet Connection Type we will use Dynamic IP (DHCP). 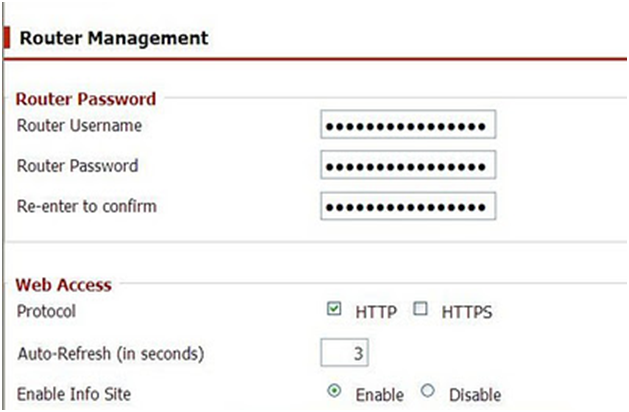 To configure the Wireless Security – Click on the Setup Tab, then Wireless Settings Tab. 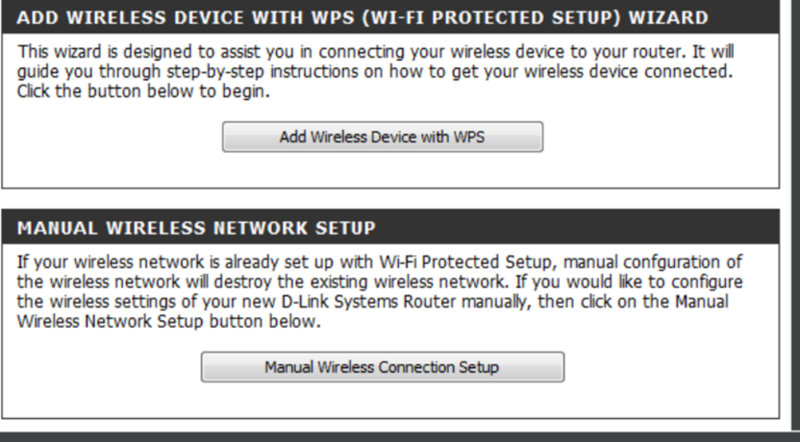 In here, you may choose to manually setup your wireless network or use the a Wi-Fi Protected Setup (WPS). Let’s choose the Manual Wireless Connection Setup. Click on the Manual Wireless Network Setup, type your SSID (wireless network name) make sure that you do not use your router’s name (default SSID). You may leave the Mode to the default which is the Mixed Mode. You may change this later on if you’re having any wireless issues. Save the setting after the changes. 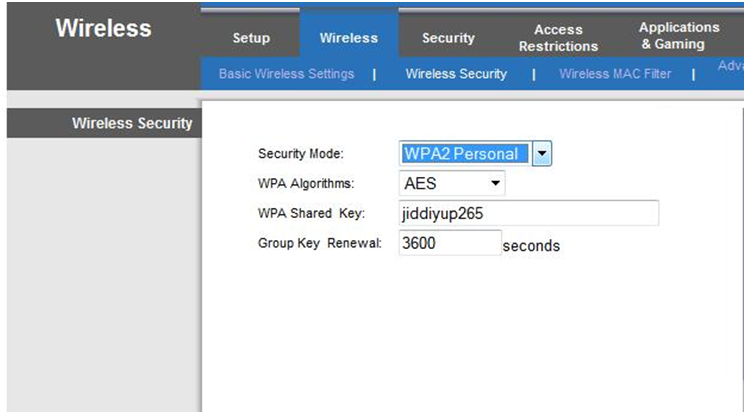 In the Wireless Security Mode, it is recommended to use WPA2. If some of your wireless devices don’t support this mode, feel free to change it but please do not use a WEP Security (not unless some of your wireless devices won’t connect to WPA2) bec. it is equivalent to a No Security. 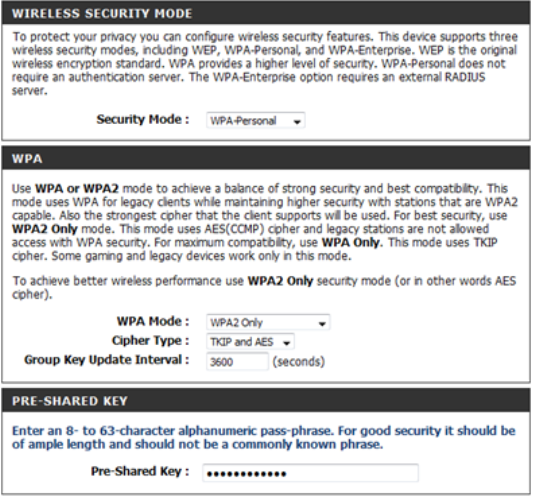 We will choose WPA2 TKIP and AES and type in a complex password but easy for you to remember. Save the setting after the changes. Take advantage of the great features in your D-Link router such as Quality of Service (QoS), Port forwarding and Guest Zone. 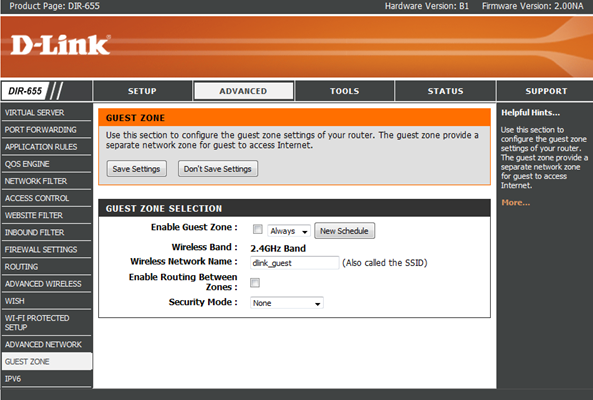 The Guest Zone is one of the nice feature of D-Link DIR 655 and not all routers have this type of option. 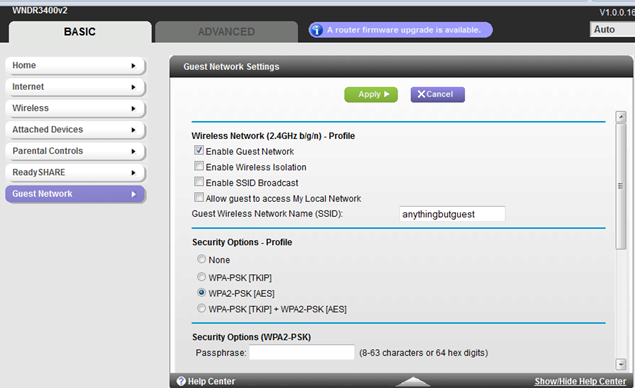 If you enable this feature, you may create a separate SSID (or wireless network) other than your own SSID for Guests use only and have them connect to a separate SSID and isolate your Guests from your own wireless network for security reason. To setup Port Forwarding, go to Advanced Tab, then Port Forwarding Tab. Make sure that you have all the Port Numbers handy for the Applications that you need to be port forwarded. Add the Application Name, TCP & UDP Ports Numbers and Schedule. Save the setting after the changes. Mac Cloning – You will need to enable Mac Cloning from Dynamic IP (DHCP) Internet Type section and click on Clone your PCs MAC Address if your ISP didn’t provide you with your IP information. If you are not sure about this you may contact your ISP. You don’t have to do anything at this point if it’s not needed. 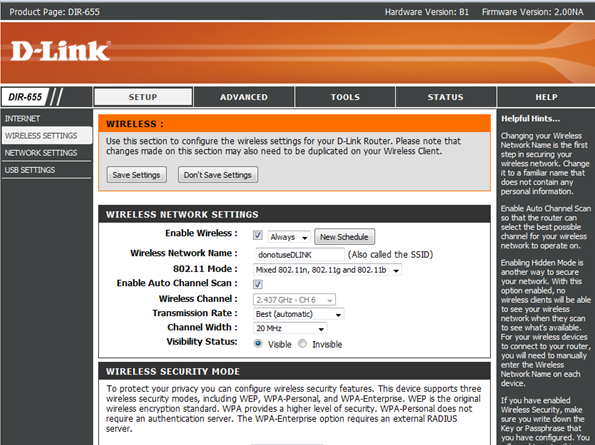 We have just concluded setting up a D-Link DIR 655 Router. Feel free to take advantage of the Support Menu just in case that you have any concerns regarding your router setting. It is located in the Support Tab. There are a few helpful information that you may utilize. Finally, you may now connect all your wireless computers and devices (smart phones, printer, gaming console, etc.). Make sure to type in the correct pass-phrase to ensure a successful wireless connectivity. If you encounter any disconnection issues on your wired and wireless network devices, you may do a Power Cycle. This Tutorial can be utilized in a business network environment. This is based on my knowledge on how to configure a Buffalo AP (Access Points)/Bridge Router (other Brand and Model of AP/Bridge Routers may have some similar features) that’s connected behind a Sonicwall TZ 210 or any Firewall/Security Appliance. An installation CD is not required in this entire Tutorial, please leave it up to me to guide you. Pre-requisites: A broadband connection, A Windows Server 2003 and above (best to use a Windows 2008 Server R2) configured with Dynamic Host configuration Protocol (DHCP) and Domain Name System (DNS), a Security or Firewall Appliance, an AP/Bridge Wireless Router capable (we will use a Buffalo AP/Bridge in this Tutorial), wired computers, wireless computers and other wireless devices such as IPad, Tablets & Smart Phones. Additional information: Your Firewall or Security Appliance must have the Network Address Translation (NAT) enabled. 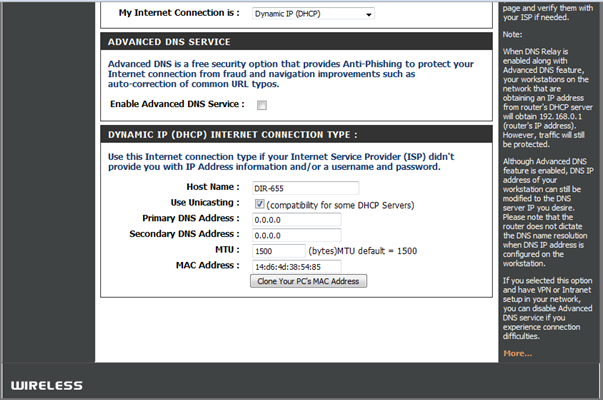 Make sure that DHCP is disabled from your Firewall/Security Appliance. Make a note of the existing Subnet of your network, for example: 192.168.1.X which we will be using in this Tutorial. Also, write the IP Address, Subnet, Gateway and DNS Server that you will be going to assign in the LAN configuration of your Router. Note that the Gateway will be your router’s new IP Address. Note: The network cables that are connected from the Modem and Network Switch to the Sonicwall’s WAN and LAN Ports will remain untouchable in this entire tutorial. It is important to remember not to disconnect or unplug any of these network cables. To begin, connect the power cable into the Buffalo Router, wait for the lights to stabilize. Connect a patch network cable from the WAN or Internet Port of the Router to the Sonicwall Port (X2, X3 etc.). Connect another patch network cable coming from a computer to another open ethernet port (X2 or X3) of the Sonicwall device. 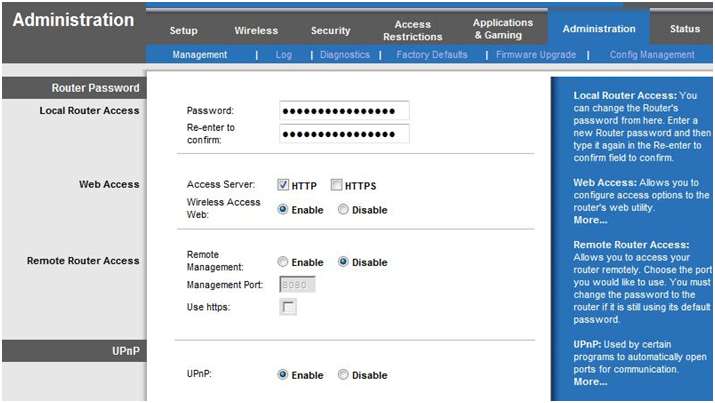 While your computer is connected directly to the Sonicwall device, modify the Local Area Network (LAN) setting. In this guide, we will be using the network subnet of 192.168.11.X (Buffalo’s Router Subnet). In Windows 7 and Vista – Click on the Start button type ncpa.cpl then press enter to open up the Local Area Connection screen. 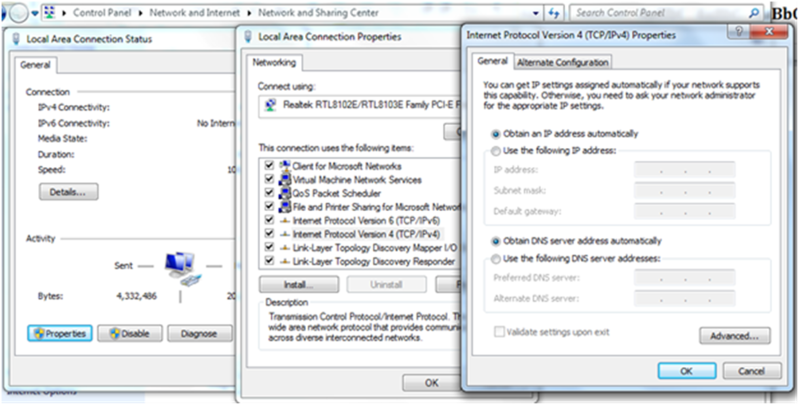 Double click on Local Area Connection, then click on Properties, double-click Internet Protocol Version 4 (TCP/IP v4). In Windows XP – Click on Start, type ncpa.cpl then press enter to open up the Local Area Connection screen. Double click on Local Area Connection, then click on Properties, double-click on Internet Protocol Version 4 (TCP/IP v4). 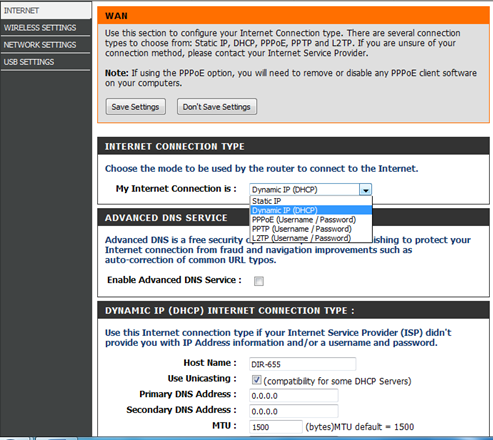 Type the IP Address, Subnet Mask, Default Gateway and DNS Server of your Network. In this tutorial we will assign an IP Address of 192.168.11.5, Subnet Mask of 255.255.255.0 and a Default gateway of 192.168.11.1. Leave the DNS Servers empty. 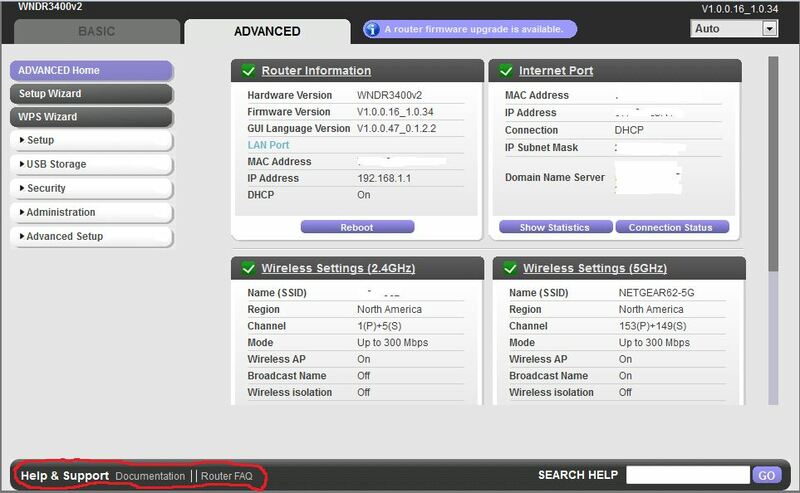 Open up a browser from your computer and type the Buffalo Router’s default IP of 192.168.11.1, it will prompt you to change the default User Name and Password, just in case you will need to enter the default. Make sure to use a complex password. Think of a combination letters, numbers and symbols for your router’s new password but easier for you to remember. In the Basic Setup Tab Disable the WAN Connection Type. In the Network Settings Tab, go to Network Setup, type in the Router’s New IP, Subnet Mask, Gateway and Local DNS for example 192.168.1.3. Remember, this is from your network’s current Subnet configuration. Make sure to disable DHCP to avoid any conflicts and verify that DHCP is enabled in your Windows Server. 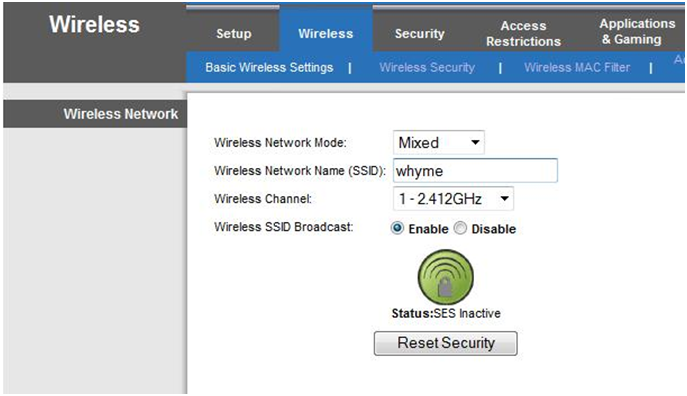 In the Wireless Tab, then Basic Settings, you may choose if you’d like to setup your Router as an AP (Access Points) or Client Bridge. I’d prefer a Client Bridge for a greater wireless coverage. 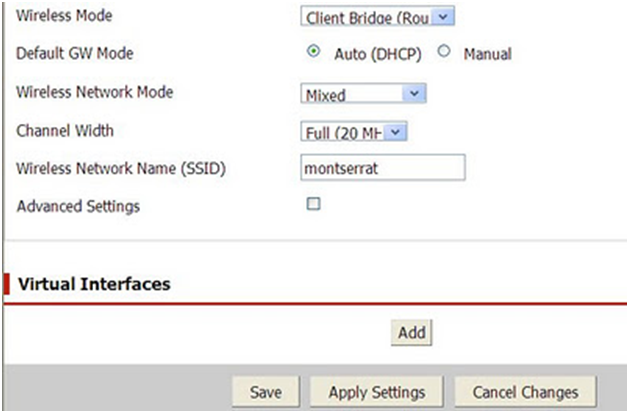 Select Client Bridge (Router). 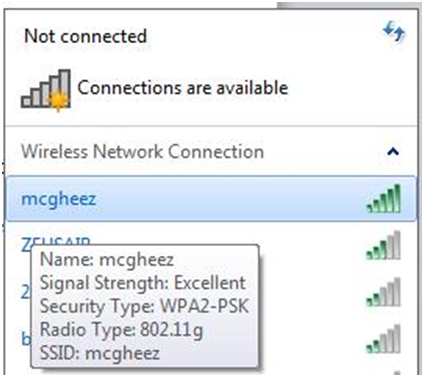 Assign an SSID for your wireless network. Do not use your Router’s Name. You may manually or use Wi-Fi Protected Setup (WPS) to secure your wireless network by using WPA2, do not use any network security lower than WPA2, you do not want your wireless network to be vulnerable from outside unseen malicious objects and threats. You may auto generate the pass-phrase or manually assign a complex password for your wireless network. In the Security page, verify that the Firewall is Enabled. Important Notes: Some ISPs may require a MAC Cloning. You will need to contact your ISP regarding this. To do this, go to Setup, then MAC Address Clone, then enable. Change the LAN’s setting of your computer back to Obtain an Auto IP address automatically. Go to Control Panel>Network and Internet>Network and Sharing Center>Local Area Connection. Unplug the network cable from the Buffalo Router’s WAN Port and unplug the network cable coming from the Sonicwall’s X2 or X3 Port. Unplug the power cable from the Buffalo router and wait for 30 seconds, then plug the power cable back again, wait for all the lights to stabilize. Now, connect the network cable to the Sonicwall’s X2 or X3 Port and connect the other end into the LAN Port of the Buffalo Router. 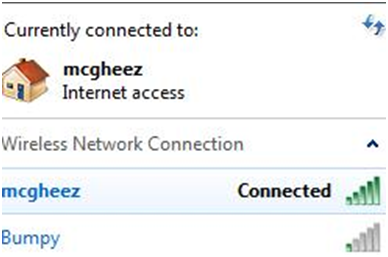 You may now connect all your wireless devices to your new SSID (wireless network name), make sure that you have the proper pass-phrase typed in. Open up your browser from any of your computers (wired and wireless) and see if you’re able to log on to your router using the new Router’s IP which in this Tutorial we assigned a 192.168.1.X. You may enable or modify other great features of your new router. 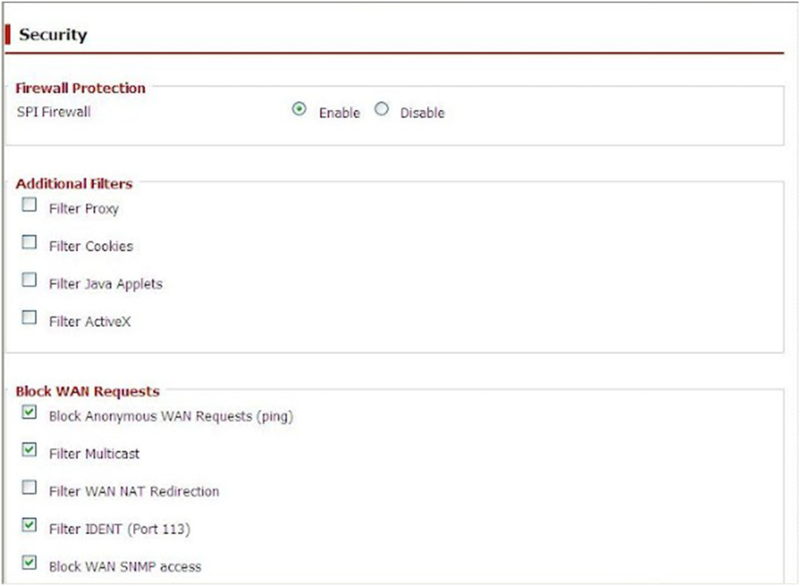 I hope that this Tutorial helped you connect an AP/Bridge Router into your Security or Firewall Appliance. Utilize the great features of your new router if you have them, for example the NAS, Guest Zone and FTP would be great to have.